To sign up to the Kings Camps Sports & Activity Camps Newsletter, simply click the Request Newsletter button below and you will receive amazing special offers, discounts and access to secret sales. 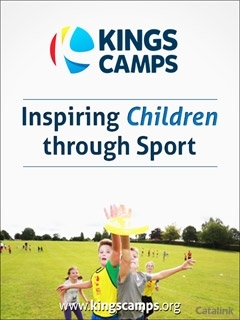 King's Camps are the UK's favourite activity camps providing exciting sports and activity camps for 4–17 year olds. With a variety of packages and a huge range of activities available there is something for everyone, from the popular Active Week package, to specialist coaching in football, swimming, cricket and dance and movement. Camps run during school holidays at 50 venues across the UK, with extended hours and flexible options available. Camps are Ofsted registered and qualified, trained coaches ensure that all children are engaged with activities and are supported to fulfil their potential, regardless of their sporting aspirations. Find your nearest camp on their website and find out more about Kings Camps, and their wider work working with children and young people around the world. By Pressing the Request Newsletter button you give Kings Camps Sports & Activity Camps (and their Data Processors for the specific purpose of delivering your emails) consent to send you their newsletter via email until such time as you choose to unsubscribe.